The final portion of the trail to the beach is very steep and slippery. Visitors should use caution and wear proper footwear. 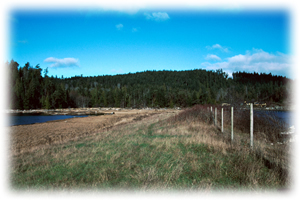 Sandwell Provincial Park, with its long sandy beach and views of the Strait of Georgia, is a favourite destination for residents and visitors to Gabriola Island. One of three provincial parks on Gabriola Island, Sandwell offers a short walking trail through the woods leading to a picnic area overlooking the sandy shores of Lock Bay. This is a lovely place to spend a peaceful afternoon relaxing on the beach or taking a refreshing dip in the ocean waters. At low tide, visitors can walk down the beach to view a prehistoric petroglyph carved into the sandstone rocks, east of the day-use area. This site is only accessible at low tide. Sandwell Provincial Park is located on Gabriola Island, a 20 minute ferry ride from downtown Nanaimo on south Vancouver Island. The park is located on Strand Road, approximately 10 km from the ferry terminal. Take North Road and turn left on Barrett Road, following park directional signs. Neary communities include Gabriola Island and Nanaimo. History/Conservation: Sandwell Park was established in 1988 to protect the archeological sites, including a petroglyph and shell middens, and their setting. The sandy beach ecosystem includes threatenedcommunities such as those found in the back dunes. Approved Purpose Statement and Zoning Plan [PDF] for Sandwell Provincial Park is available online in pdf format. All anglers should check the current regulations issued by Fisheries and Oceans Canada prior to fishing. Anyone fishing or angling in British Columbia must have an appropriate licence. The park does not have a boat launch. The nearest boat launch is located at Silva Bay on Gabriola, approximately 5 km from the park. An 800-meter walking trail leads from the parking lot to the day-use/picnic area on the beach at Lock Bay. The final portion of the trail to the beach is very steep and slippery. Visitors should use caution and wear proper footwear. Pets/domestic animals must be on a leash and under control all times. You are responsible for their behaviour and must dispose of their excrement. Pets/domestic animals are not allowed in beach areas. There is no designated swimming area at this park however the sandy beach at Lock Bay is a nice spot for ocean swimming. There are NO LIFEGUARDS on duty at provincial parks. The beach offers lovely views of the Strait of Georgia. A prehistoric petroglyph is located east along the beach from the picnic area and is accessible during low tide. A picnic area overlooking the sandy beach at Lock Bay is located approximately 800 metres from the parking lot. Facilities include 2 picnic tables, pit toilets and an information shelter. This park has 2 pit toilets, located at the day-use/picnic area next to the beach at Lock Bay.